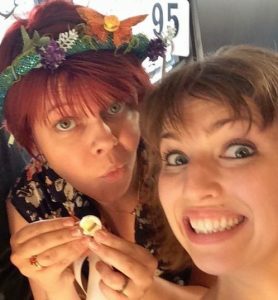 Yes, the rumors are true: I quit my Whole30. Part of me feels like a quitter, and I don’t like that feeling. Part of me is worried I sacrificed my best chance this year (while it’s cool enough in LA to cook) at getting a full-picture look at how different foods affect my body. But ultimately, I reject those last three. By Saturday Feb. 17th, my 13th day on the diet, we had finished all of our leftovers. In total, we had cooked 11 out of those 13 days. For me to succeed with this diet, I knew I’d have to LOVE my meals, so I focused on making sure I’d fulfill that requirement at every turn, but that required A LOT of extra shopping, prepping, cooking, and packing. There’s not a whole lot you can buy on Whole30 and skate your way through with; if you’re going to truly love what you’re eating, you’re going to have to prepare it yourself. The whole point is to eat whole foods with minimum processing. So Day 1 of my 3-day weekend, we were already out of food and had to shop and then cook. And it wouldn’t be enough to just cook ONE meal, because if that’s all I have on hand to eat, I’m going to burn out. I needed at least 2-3 prepared items at a go, so I was staring down a Saturday of prepping at least 2 meals. That’s not how I want to spend my Saturdays. Like, at all. We managed to find a compliant rotisserie chicken at Ralph’s, which we took home and tore into like wild animals. But we had no veggies prepared as a side, so I just dipped it into some truly not at all great Annie’s BBQ sauce (compliant and available at Whole Foods). The whole effect just tasted…sad. I wanted to relax, dammit. I wanted to ENJOY MY TIME. And this diet was keeping me from that. And then it hit me: Including the 10-day reintroduction period, which includes 6 days of eating completely compliant, my Whole30 wasn’t going to be over until MARCH 17th. And it was only FEBRUARY 17th. And I’d been devoting all of my sanity and free time to this diet instead of focusing on my business (which honestly needs to be my top priority) and enjoyment of my own life. Well…that’s not a healthy life choice. Not for me. So I called it. Time of Death: 7:09 PM. I ate a few Triscuits in a half-hearted attempt to “reintroduce” wheat, then said screw it and ate a Reese’s Peanut Butter Egg. It was glorious. And my stomach felt fine for the rest of the night and weekend. Ate pizza the next day (being careful to take 2 Lactaids; I’m just super nervous about dairy coming off of all this after feeling so great and non-bloated for once). Felt fine! And I felt MORE than fine, to be honest. I felt sane again. The kicker is…I’m still cooking despite my annoyance with it. What can I say? Whole foods are addictive. I mean without question we have eaten FANTASTIC home cooking for the past two weeks. Can you blame me for not wanting to return to freezer fare? Not to mention according to my rules I stated in my previous post, I am fully determined to eat like this on weekdays going forward. 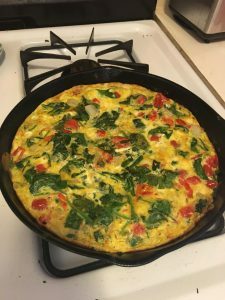 Behold this lovely spinach-tomato frittata! A sprinkle of fresh lemon juice and zest on top before broiling gives the whole thing a fun brightness. 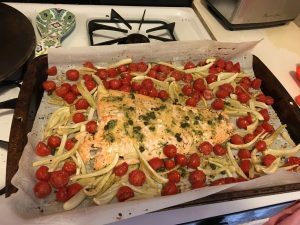 And here we have a lovely roasted salmon with tomatoes, fennel, and a caper-mustard sauce. Anyway. We cooked it Monday afternoon and it turned out great. The end. Awww, I’m picturing your sugar dragon as a weird dragon-monkey hybrid, whose back is studded with M&M spikes and is always drooling. And I’M SO HAPPY you got past your weird salmon block! I know we’d discussed it before and I LOVE SALMON. Next step: the Kenji pan-searing method!